"Delicious vegetarian pasta recipe. My kids even love it! It's quick and easy...I discovered it by throwing together things I happened to have in my kitchen." Fill a large pot with lightly salted water and bring to a rolling boil over high heat. Once the water is boiling, stir in the broccoli rabe, and cook until just tender, about 5 minutes. Remove with a slotted spoon, and set aside. Return the water to a boil, and stir in the macaroni. Cook the pasta uncovered, stirring occasionally, until the pasta has cooked through, but is still firm to the bite, about 8 minutes. Drain well in a colander set in the sink. While the pasta is cooking, cook and stir the walnut halves in a skillet over medium heat until fragrant, about 5 minutes. Set the walnuts aside, add the olive oil, and reduce heat to low. Stir in the garlic, and cook until golden brown, about 3 minutes. 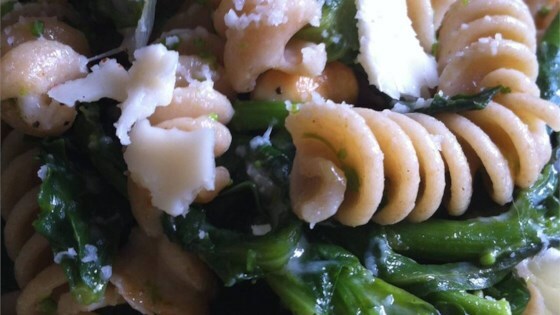 Stir in the broccoli rabe, and cook 3 minutes to reheat. Season to taste with salt and black pepper, then stir in the drained pasta and walnuts. Toss with Parmesan cheese before serving. Really simple, really yummy! Great way to use rapini. Sounded too simple....but it was excellent. My husband & daughter loved it too! Used orrichette, double the garlic, made a mix of romano and parm. Delicious and quick. i love this kind of "whatever's in the kitchen" recipe! Very simple, but I never would have thought to mix nuts and rapini... Turned out great! I think this would make a great base recipe for a pasta salad as well. I just made this yesterday. The only thing I added was light cream to make it more moist. It came out very good. Will make again.